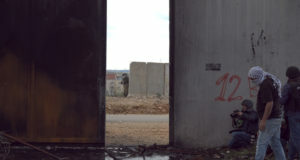 Following the Israeli army invasion of Deir Istiya on October 7th, during which the Israeli Occupation Forces (IOF) imposed a curfew on the village, one which officially continued throughout the next day, Human Rights Workers visited with families who had been subjected to IOF house raids and arrests. The IOF entered homes during this latest raid on the northern West Bank village of 4,000. In one home, Occupation soldiers entered the home and seized three children, ages 11, 15, and 16, taking them out of the home to a nearby schoolyard to interrogate them. The youths were accused of having thrown stones at the invading IOF forces from the rooftop of their home. An hour of interrogation, during which soldiers kicked the youngest boy, resulted in little more than harassment of the youths. The army realized that they had no reason to hold the youths, and so returned them to their house. The soldiers had arrived in three military jeeps, approximately 20 soldiers of whom remained outside while four soldiers proceeded to search and ransack the house, from bottom to top, before leaving. The family reports that soldiers returned two hours later, parked in front of the home and waited for a while before again leaving. IOF soldiers later went to both boys and girls schools, interrupting students in their classes. Although the schools were opened, the curfew was still imposed and officially remains so as of the evening of October 8. Villagers at the west end of Deir Istiya reported hearing sounds bombs going off around 8 pm that evening. HRWs also visited families who had suffered from Israeli army violence just over a week ago when they invaded. During that invasion, at least 3 youths were kidnapped by IOF soldiers. One family recounted how approximately 20 IOF soldiers had come to their home 8 days prior after 1 am while the family was sleeping. One daughter had been sleeping in the front room when she heard noises outside. Calling her parents in the next room via her mobile, the family soon learned that their home was surrounded by Israeli soldiers. While the soldiers did not demand entry, they instead proceeded to throw stones at the two entrances doors in the front and the windows around the house. Later inspection revealed the IOF soldiers had broken a window in one front-facing room, as well as a window in the family vehicle around the back of the house. After waiting for the soldiers to cease stoning the house, the father finally opened the door to ask what they wanted. The father and mother report that 4 soldiers entered the home, and beat the father and one daughter, 23 years old, and his wife all over their bodies. The family of 8, including three children under 18, was made to leave their home and were kept outside, guarded by soldiers, while 4 soldiers searched and ransacked the home for approximately another 45 minutes. The father managed to gain entry into his home and accompany the soldiers as they went room to room, damaging the home and their possessions. While these acts of collective punishment are common in occupied Palestine, adding yet further misdeeds to a litany of IOF misdeeds to civilians, the family’s greatest sorrow that day was the kidnapping of their son: the youth, 19 years old, is a student at Salfit University and is not involved in political activities. He was taken during this house raid, in his underwear as he had been sleeping. Soldiers would not permit his mother, desperate to clothe and help him, to give him a shirt and pants. The youth was taken blindfolded from the house and dragged down the street nearly a half kilometer away. At one point, the mother recalls, he was pushed from his standing position and kicked while fallen on the ground. The family was given no information on the whereabouts of their son, and have since been making all efforts to locate him, without success. Two other youths, ages 18 and 19, were also kidnapped by IOF soldiers that evening. 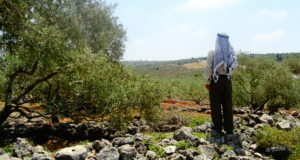 Another village resident, Dr. F, a professor at a local university, mentioned that it is common for the IOF to raid villages throughout the year, but particularly around Ramadan and the Olive Harvest season, when families are especially keen to avoid problems from either soldiers or settlers. 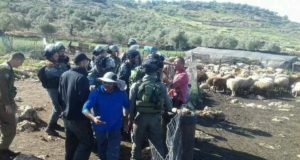 He feels that the increase of attacks by both settlers and IOF soldiers is part of a greater plan long put into practice of dividing society at all levels, economically and communally.